Buy Hot selling sunflower oil making machine /peanut oil processing machine with reasonable price - Shandong Microwave Machinery Co.,Ltd. Hot selling sunflower oil making machine /peanut oil processing machine with reasonable price manuctured by Shandong Microwave Machinery Co.,Ltd. Hot selling sunflower oil making machine /peanut oil processing machine with reasonable price 10-500T/H oil material first cleaning,drying and storage section turn-key project. Hot selling sunflower oil making machine /peanut oil processing machine with reasonable price 100-3000 T/D oil pretreatment, shelling and pre-press workshop turnkey project (soybean hot peeling, bean skin crushing; the soybean extrusion, high oil contained pre-press cake extrusion, and high oil contained embryos puffed; of direct puffed). Leaching workshop turnkey project Hot selling sunflower oil making machine /peanut oil processing machine with reasonable price(Towline extractor, Rotocel extractor, loop type extractor, DTDC separated machine, the full negative pressure evaporation, paraffin wax recovery, leaching workshop degum, phospholipid concentrate). 30-1000T/D oil continuous grade two or one physical (chemical) refining Hot selling sunflower oil making machine /peanut oil processing machine with reasonable price. 10-200T/D Fatty acid esterification production Hot selling sunflower oil making machine /peanut oil processing machine with reasonable price. The oil content of sunflower seed is 40-60%. Some kind need move the shell of the sunflower seed, while some kind don’t. According to actual situation, we can design a most suitable line for each customer. The main function of the sunflower seed pretreatment is to improve the sunflower seed quality as much as possible, and helps to get most oil from the sunflower seed. 1) Magnetic:The first step is to move the iron in the sunflower see, because the iron will harmful to the following machines. 2) Cleaning: After going through the cleaning sieve, the impurities in the sunflower seed will be cleaned. 3) Husking machine: The clean sunflower seed enter the husking machine to move the shell of the sunflower seed. The hulling rate is about 90%. separating. The second step is precise separating. The shell rate is less than 0.5% after this step. 5) Dryer: After separating the shell and nut, the nut will be dried under 60℃. Then the water content will be 8-9%. 6) Flaking roller: After the flaking roller, the thickness of cake is about 0.5mm. 7) Cooker: The cooker helps to adjust the water content of the material to 6-5kg/cm³. 8) Oil presser: The crude oil is got by oil presser. After moving the solid impurities in the crude oil, the oil will be clean. 1.Improve the quality of the oil and the cake. 2.Increase rate of productivity and reduce residual oil. 3.Increase the capabilities of the equipment. 4.Lessens wear and lengthens the life of the equipment. After the sunflower seed pretreatment/press equipment, the cake also can be extracted oil by solvent way or refined the oil to the best quality. If you want to know more about it, please contact us. 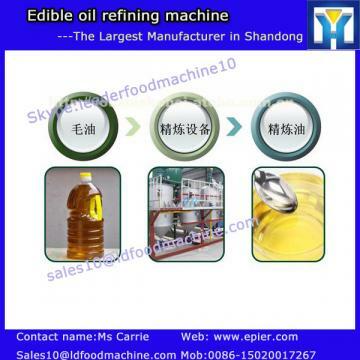 If you are interest in our sunflower oil making machine , please tell me your raw materials , daily capacity, requirements of final products, so that we can accord to your demand to amke a professional proposal. Shandong Microwave Machinery Co.,Ltd.is a Edible oil refining machine factory specializing in the production of Hot selling sunflower oil making machine /peanut oil processing machine with reasonable price, scientific research,manufacturing,installation, commissioning.Shandong Microwave Machinery Co.,Ltd.can provide Edible oil refining machinecustomers with design and services of 1-2000 tons Hot selling sunflower oil making machine /peanut oil processing machine with reasonable price. Shandong Microwave Machinery Co.,Ltd. have finished hundreds of successful projects Edible oil refining machineover the years: peanut oil, soybean oil, rapeseed oil, cottonseed oil, sunflower oil, sesame oil, animal oil,grape seed oil, acer truncatum oil, peony seed oil, walnut oil, hemp seed oil, pine oil, tea seed oil, papaya oil, milk thistle seed, and other special type Edible oil refining machineoil. Shandong Microwave Machinery Co.,Ltd. have independent import and export department. Shandong Microwave Machinery Co.,Ltd. Edible oil refining machineequipment has been successfully exported to more than ten countries: Russia, Australia, India, Afghanistan, Cameroon,and so on.